I’ll go a little out of my way for a free cup of coffee and a bagel. I stopped by the first of this summer’s Breakfast at the Bridges events back on May 27. It was along the Fern Ridge Path at the Blue Heron Bridge. That’s the little bridge over the Amazon slough by Caesar Chavez Elementary School, near the Albertson’s at Chambers and 18th. What is Breakfast at the Bridges, you ask? Well, as you come upon the breakfast, you’ll see some tents erected on the grass. And when you stop, you’re likely to find some cyclists standing around eating bagels, chatting, pouring cups of coffee and drinking smoothies made on a pedal-powered blender. Cyclists of all sorts, mind you. A melting pot. There’s usually a bicycle mechanic on hand, who will do a quick safety check on your bike. I think there are some city employees hanging around, spreading cycling goodwill (the city helps sponsor these events). So you can chat with them about transportation issues, if that’s what you like to do early in the morning. Somebody might hit you up to join GEARs. It was barrels of fun. Anyway, don’t fret that you missed the first one. The breakfasts are held the last Friday of every month from May through September. Which means the June one is coming up this Friday. June 24: DeFazio Bike-Pedestrian Bridge (the one by the Ferry Street Bridge). July 29: Greenway Bike-Pedestrian Bridge (the one between Maurie Jacobs Park and the Valley River Center mall). August 26: Amazon Path and 24th Avenue. September 30: Frohnmayer Bridge (i.e., the bridge formerly known as the Autzen Footbridge). You should go, because at the May breakfast I heard some of the people working the event wishing for more turnout. Of course, if they really wanted to draw a crowd they’d make it Happy Hour at the Bridges and ditch the pedal-powered blender for … this. Where I live, there is only one Bike to Breakfast event per year, and on that day this year, the weather was really unpleasant (see video). I really like the idea of spreading the risk among several days. I always think I’d like to go to one of the bridge bike breakfast thingies, but I can’t eat bagels and I don’t drink coffee. So it would be me getting up and riding over there and…um…standing around…and then coming home. I have many LOLZ on the Flagstaff video. Risk? ROTFLMAO. Well, the smoothie I had was pretty good, too. 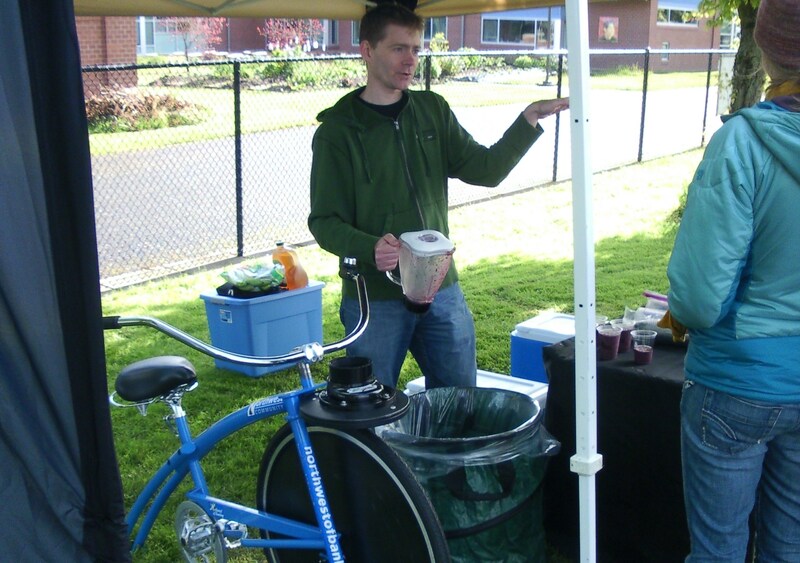 I mentioned the pedal-powered smoothies, right? Maybe you could offer to pedal the bike blender. Embarrassed to say I had to resort to Google on ROTFLMAO. For some reason the guy in the yellow poncho (in Ted’s video) cracks me up.